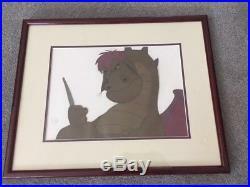 WALT DISNEY 1977 PETE'S DRAGON CARTOON ANIMATION PRODUCTION CEL. OF Elliot, the magical and sometimes mischevious dragon. Museum-quality double-matted and framed to an overall size of 21 x 17. This is an original production cel painting actually photographed during the making of The Walt Disney Company's production of Pete's Dragon. Comes with Disney's Certificate of Autenticity and has an embossed Disney stamp. 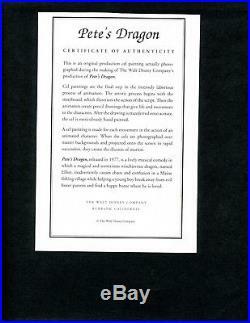 On the laminated protective cover. A few minor scratches on the frame but otherwise in fine condition. We closed our retail galleries and now are totally internet sales oriented. We are a long-time member of UACC #RD338 and the Manuscript Society. Our collectibles make for fantastic additions to long standing collections, great starting points for new collectors looking for trusted authentic material, and make for a truly unique gifts for that special person in your life or corporate gift for a special client. History Makers Autographs offers one of the strongest guarantees available by any dealer. We unconditionally guarantee the authenticity of the document/artwork , without time limit, to the original purchaser. Every item we sell comes with a Certificate of Authenticity clearly stating this guarantee. 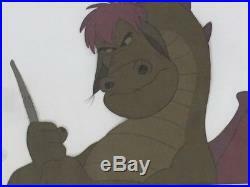 The item "WALT DISNEY 1977 PETE'S DRAGON CARTOON ANIMATION PRODUCTION CEL OF ELLIOT" is in sale since Saturday, August 4, 2018. This item is in the category "Collectibles\Animation Art & Characters\Animation Art\Production Art". The seller is "stevnowli_0" and is located in Nokomis, Florida. This item can be shipped worldwide.